How often can I add money to my Credit Builder savings account? As often as you like in increments of $50 or more, up to a maximum of $3,000 total in the account. How soon after a deposit into my savings account is made will my credit line increase? You will see your credit limit increase approximately 1 to 2 business days following the day of the deposit. How much interest can I earn on the Credit Builder Savings account? The interest rate will follow the rate paid on other savings accounts, currently 0.05%. Can I use a savings account I already have to secure my Credit Builder card? No, a specific savings product for the Credit Builder program has been created and needs to be used as the collateral account. Can I withdraw money from my Credit Builder Savings account? No. 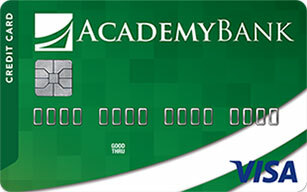 The savings account acts as collateral for your secured card, so regardless of whether or not you have a balance on your card, you may not withdraw money from the account while your credit card is secured without closing both the Credit Builder savings account and the Credit Builder credit card. Can I use this savings account as my Saving Cents account? No. We recommend you open a second savings account and link that account with the Savings Cents program.